In years gone by, when people imagined the 21st Century, they predicted everything from hoverboards to cryogenic freezing and teleportation. One rather more mundane aspect of modern living that the futurists overlooked was the fact that more and more of us would be living at home with our parents. New research has found that in 2014, for the first time in more than 130 years, young American adults were more likely to be living with their mum and dad than they were to be living with a spouse or partner in their own household. 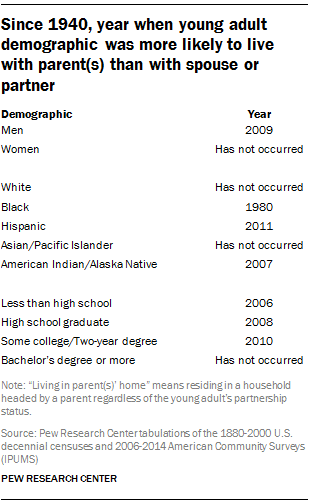 New Pew Research Center analysis of census data shows that in 2014, 32% of young adults were still living in their parental home, 31% were living with a spouse or partner in their own household and 14% of young adults were heading up a household in which they lived alone, were a single parent or lived with one or more roommates. The remaining 22% lived in the home of another family member, a non-relative or in group quarters such as a college dormitory or prison. Changes in marriage patterns, educational attainment and the job market have transformed the way young people are living. 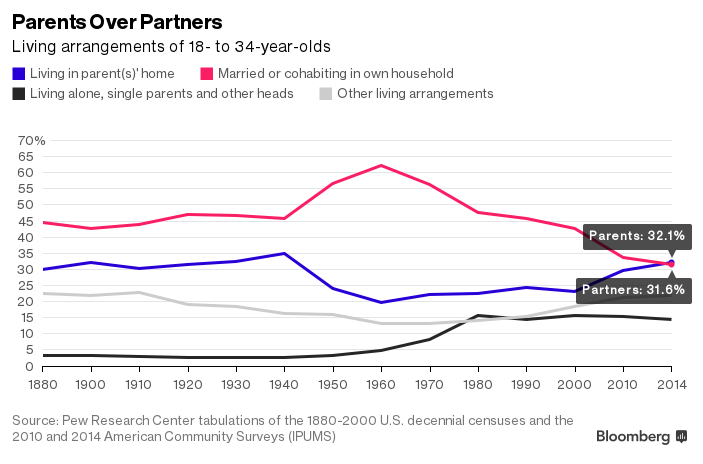 The main thing driving the trend is the drop in the number of young Americans choosing to settle down in a relationship before the age of 35. Back in 1880, people tended to move from their parents’ home into their own marital home in early adulthood. This type of arrangement peaked in the 1960s when 62% of 18-34 year olds were living with a spouse or partner and only 20% lived with their parents. It has been in decline ever since. Is it just about marriage? Adults waiting longer to settle down is the main driver of this trend but there are other important factors at play. One is the growth of the so-called ‘Boomerang Generation’ of young people who move back in with their parents for a variety of economic reasons. Unemployed people are more likely to live with their parents and employment among young men, in particular, has fallen in recent decades. The share of young men with jobs peaked around 1960 at 84%. In 2014, only 71% of 18- to 34-year-old men were employed. In addition, wages (after adjusting for inflation) have been on a downward trajectory since 1970 and fell significantly from 2000 to 2010. As wages have fallen, the share of young people living in the home of their parents has risen. The Great Recession has also been associated with an increase in young adults living at home. Initially in the wake of the recession, college enrolments expanded, boosting the ranks of young adults living at home. Now, given the weaker job opportunities facing young adults, living at home is part of the private safety net helping young adults to weather the economic storm. Is everyone behaving the same way? The increasing share of young people living in a parent’s home has occurred across gender, racial and ethnic lines but break down the data and you see that amongst some groups the trend is much stronger than others. The best predictors of whether a person lives with parents are race, gender and whether they graduated from college. Amongst people who left education after High School, 29% live at home. For college graduates, the share is only 19%. The following chart shows in what year, if at all, a particular group became more likely to live with parents than a spouse. A young black person has been more likely to live with a parent than a partner since 1980. The crossover has not yet occurred for young white people. Similarly, men have been more likely to live with a parent since 2009 whereas amongst women, the crossover has yet to occur. The arrangements of young men and young women do not mirror each other, in part, the report says, because young women tend to marry slightly older men. Is the US heading for a student debt crisis?